These taste just as good as the carb-loaded mozzarella sticks! Honestly, I could eat these in replacement of regular mozzarella sticks even if I wasn’t on keto. I didn’t even need a fryer of any sort to make these, I made them on the stovetop with a little bit of oil in a pan. Super easy! I used KetoLuxe Italian Seasoning which has zero carbs in it, but you can use whichever seasoning you desire or make your own! If you are making for a specific event or time make sure to plan for a few hours in advance due to some freezing time that is needed before frying. 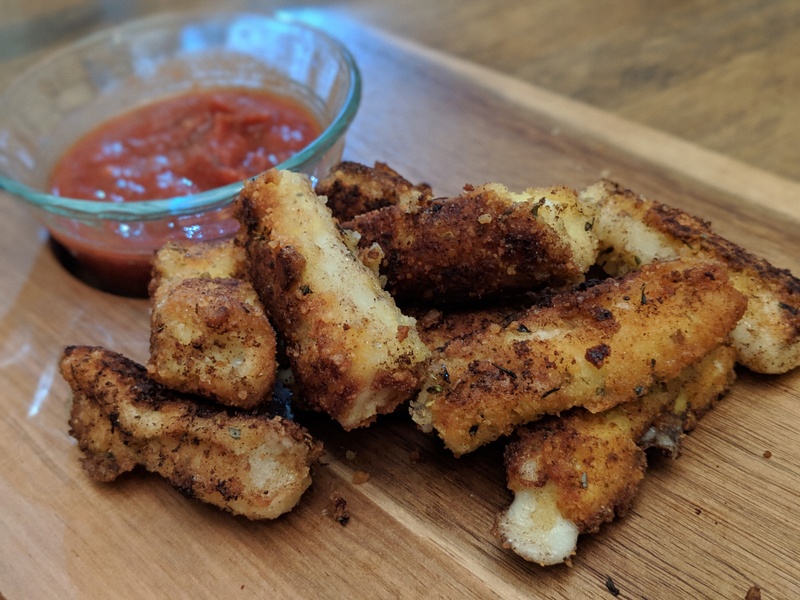 To get the mozzarella sticks to fry perfectly (without melting the cheese completely) you’ll want to freeze them at least an hour prior to frying. I made them a day in advance, froze overnight, and fried them up for dinner the next day. At only 1g total carb per stick, you can afford to indulge on several of these tasty little guys! Mix eggs and garlic powder in a bowl. Mix coconut flower, baking powder, Parmesan, and Italian seasoning in a separate bowl. Cut each mozzarella stick in half. Dip each half in the egg bowl and then in the dry ingredients bowl. Do this twice per mozzarella stick (it gets a better coating this way). Line dipped mozzarella sticks on a parchment lined pan or container, place in the freezer for at least 1 hour. When ready to fry, heat about 1/8 of an inch of oil in a pan large enough for frying, on medium-high heat. Once oil is thoroughly heat, fry several frozen mozzarella sticks at a time. Turn until fully fried on each side. Serve with a low-carb marinara!